Welcome to Think Big! Where we here at Monkey & The Bug show you how to translate some of our favorite fashionista’s looks into wearable outfits for your little one. Today we are showing off THIS adorable stripped boat neck top by Nico Nico. How cute is Taylor Swift in her boat neck top? She embodies the all American girl and this look is comfy but not frumpy. Perfect for a play date at the park! It’s no wonder that Rachel Bilson is featured on just about every style blog out there! Her style is effortless and very cool. 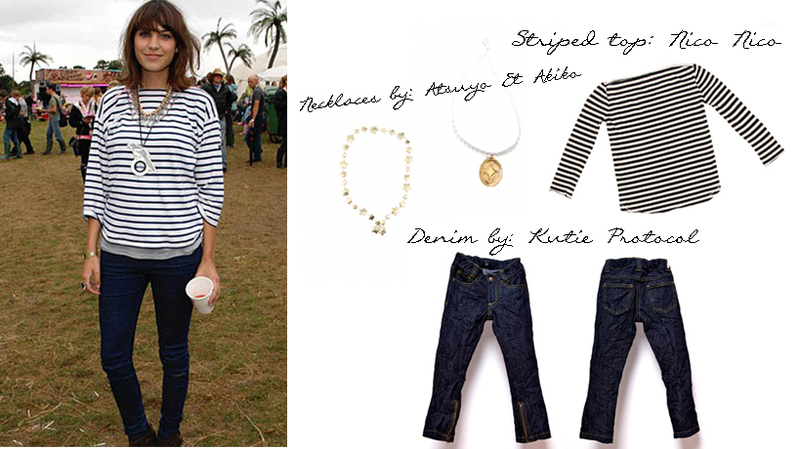 We love what she did with her stripped tee, pairing it with a classic trench and skinny jean. Olivia Palermo has a knack for taking casual pieces and glamming them up. Here, she rocks her short sleeve stripped tee with shiny shoes and a girlie girl skirt. This look carries over perfectly for a little girl. It’s casual enough for Sunday brunch with the fam and fancy enough for a tea party with her friends. “It” girl Alexa Chung always puts her stamp on an outfit. This look is super simple but she still manages to make it her own by layering bold statement necklaces. Necklace left. Necklace right. Top. Denim. we hope you enjoyed our first Think Big feature! Have ideas or suggestions for our next Think Big? Feel free to email us at Info@monkeyandthebug.com We love hearing from our readers! Great round up. They really do look sharp. Thanks for visiting the blog. It must have been pretty humorous to see the 3 kids outfitted like triplets! I don’t even put the twins in matching clothes; trying to stay true to their individual personalities. I love fashionable looks that are age appropriate and these outfits all strike the perfect balance between hip and sweet. I think my daughter looks the best when she is wearing something classic like the striped top pictured. Great picks! Thanks so much for visiting the blog and your kind words. Please keep checking in with us, as we hope to continue to provide stylish and appropriate trend reports for this spring season. I am all over this. Perfectly styled. Thanks for stopping by my blog, loving yours! Thanks for the visit and kind words! Please keep checking our posts for additional spring trend reports.